Roulette stand for “little wheel” in French. The name of the game appeared in 18 century. Playing roulette is impossible without its the most important part which determines the winner - the roulette wheel. According to the historical notes the first wheel was created accidentally by Blaise Pascal, a scientist why tried to create the perpetual motion machine. Roulette wheel is usually made of wood and it is placed at the long table, which is covered with green felt. The wheel has two principal parts – a static bowl and the wheelhead. The static bowl rotates the wheel head, when the croupier spins the wheel. Static bowl is usually made of wood, but it also has plastic items, which serve to divide the slots with numbers. 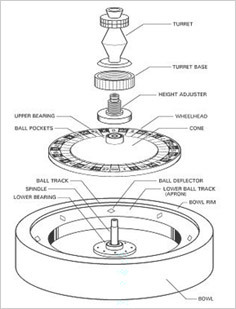 The bowl is the outer part of the wheel and it includes ball track, lower back track, spindle and canoe stops. An average bowl has 32 inches in diameter. The wheelhead has 20 inches in diameter and it sticks to the spindle. At the top of the wheelhead there is a cone which directs the ball and a turret which hide the part of the inner mechanism. Also this part of wheel contains pocket with marked numbers. There can be 37 or 38 pockets depending on the layout. American roulette wheel is a lot like the European one, though it has one more betting zone for a double zero. Dip in the wheel, when one of the part of it is lower, than others. In this case, attentive player always bets on the numbers, which are at the lower position. Loose of frets, which limits the bouncing of the ball. It leads to the situation, when there are only a few winning numbers. Damages of the inside mechanism are usually unseen for the players, but those who monitor the tables of the roulette may notice some regular occurrences and biased wheel.